Our Thanksgiving is approaching quickly, yet I'm still in a very Summer-y state of mind. So I thought it would be fun to adapt a colorful palette just a bit and bring out some Autumn accents. 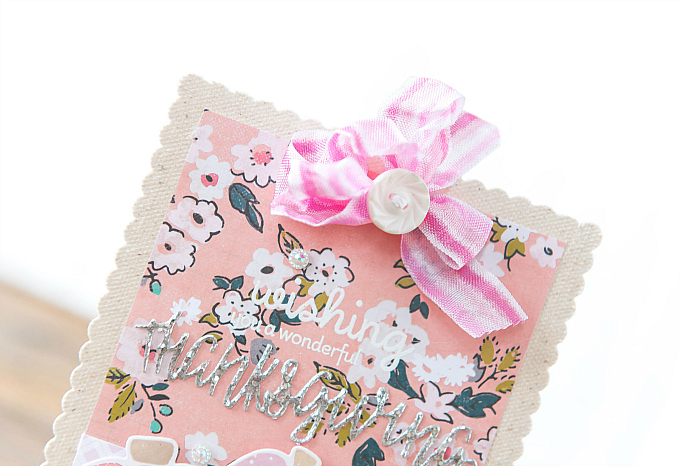 The first thing I think of when cooler weather approaches is chunky, cozy layers, and this lovely canvas base is the perfect way to add a bit of textured cozyness to my card. But keeping in mind fresh floral hues, I also added two patterns in feminine colors: this pretty Pinkfresh print, and this sweet floral print. For the topper, I added a striped bow (DIY tutorial here), and also a sweet vintage button. 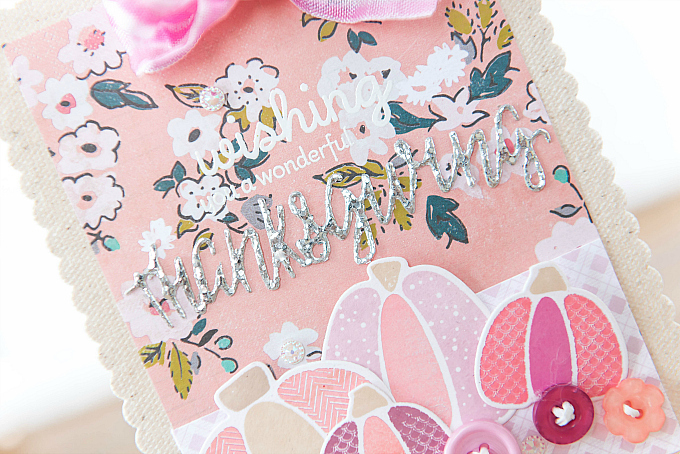 I stamped a portion of my sentiment using Purls of Wisdom stamps from Papertrey. They are discontinued, but since this is such a generic saying, it would be really easy to use an alternative. I really love adding a touch of sparkle to holiday cards, so I used a really delicate font to die cut a gorgeous glitter cardstock. I prefer to use cardstock when working with such fine details, as covering this neatly in chunky glitter after the fact would have been much too fussy for my liking. But if you prefer glittering things up, try a thicker font - such as this die. I love that it is interchangeable - a very versatile addition. At the bottom of the card, I added a pile of stamped pumpkins, using another older PTI stamp, Pumpkin Patch. I really hope you've had the chance to pick this stamp up while it was still available. Happy Autumn, dear friends & thank you for your visits. 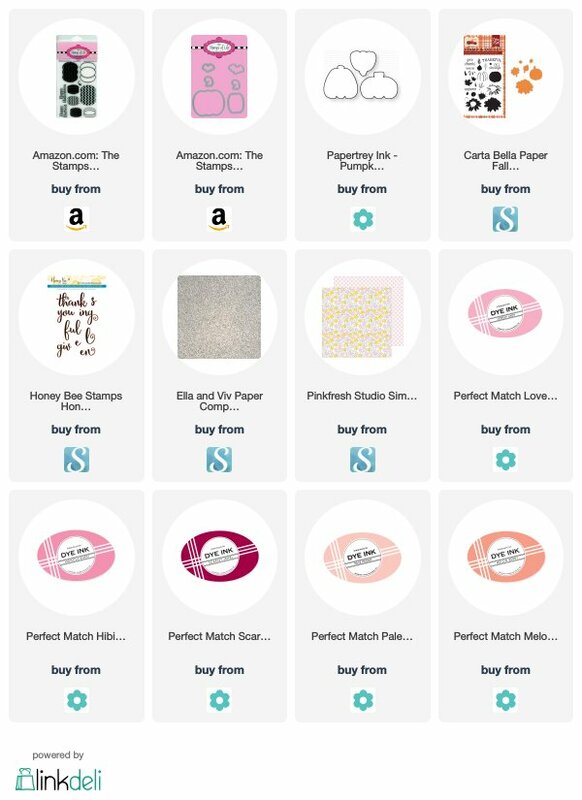 I adore those papers you used and love the soft colors you used for those pumpkins. FABULOUS card!! 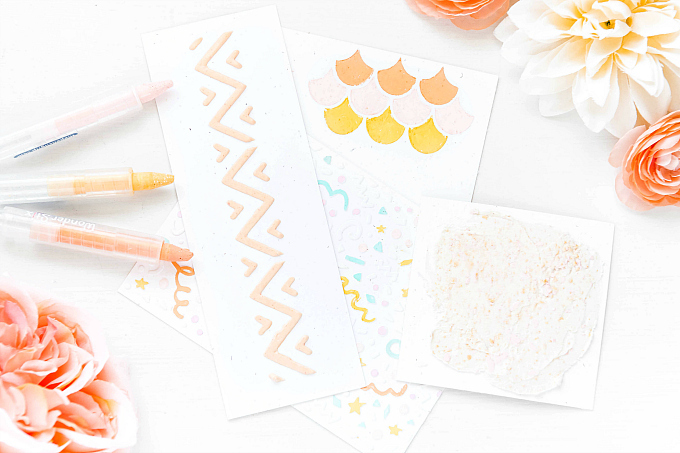 I so love pastels, but I've never used them for Thanksgiving! 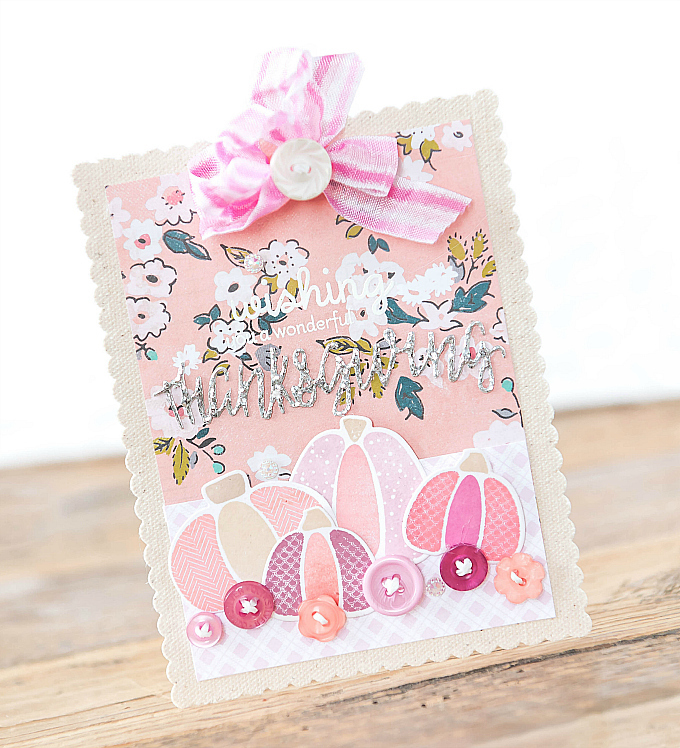 This is one incredibly beautiful card, Ivana! Thank you so much, Greta! I've been really enjoying switching things up color-wise! Love the non-traditional fall colors, this is darling Ivana! Those pumpkins are extra sweet! What a sweet color combo Ivana~beautiful details! Thank you so much, Marlena! Hugs to you!